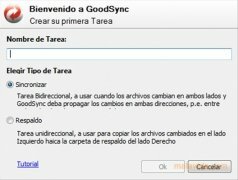 GoodSync is a simple and useful tool with which you can synchronize files between different computers. Thus, the user will be able to make sure that both systems share exactly the same contents, without losing data and avoiding files to be duplicated. It is a bi-directional file copying method, even though it is also capable of creating synchronized copies in a single direction. This software is an effective solution when it comes to completing backups on your computer. Its configuration possibilities, that are very simple, allow the user to synchronize data of all kinds between two different computers or even external discs. It is also possible to synchronize by means of remote FTP, Secure FTP and WebDAV servers. 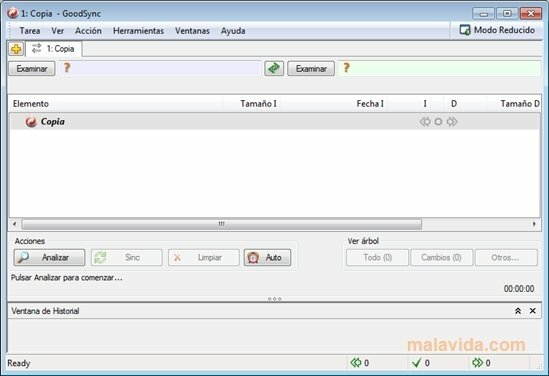 With GoodSync it is even possible to automate its activity based on various parameters, that will save work to the user. Automatic synchronization and backups of emails and pics. Its visual system to compare files and its distribution based on tabs, its real-time process monitoring and detailed action history complete a unique application to synchronize devices and complete backups. GoodSync is already on our favorites list.